Medigrity Innovations Private Limited was started in 2011 by a group of highly experienced and qualified Medical Practitioners from various medical specialities and Technocrats & Management experts with rich experience in the latest technologies and management strategies. The word "Medigrity" is a combination of two words – Medical and Integrity, which emphasises the integrity that is a part of the services we provide to the medical community. 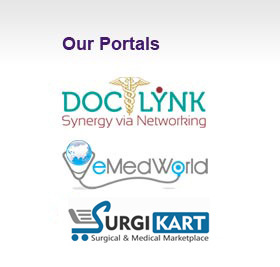 Medigrity comprises of three internet based application portals – DocLynk.com, eMedWorld.com and SurgiKart.com – each aimed at enriching the medical community taking advantage of the latest technological trends. DocLynk.com is a state-of-the-art internet based free, safe and secured professional networking platform that helps the medical practitioners (Doctors and Dentists) and medical students to connect, collaborate and share knowledge. eMedWorld.com is a medical portal that helps patients and medical service seekers find the best of Healthcare providers and to make informed decisions. DocLynk.com and eMedWorld.com are designed to complement each other. SurgiKart.com helps Healthcare providers and other medical related businesses and consumers in procuring their Medical and Surgical equipments / components in the most cost-effective manner. Dr. Lakshmi KrishnaLeela Baisetti MD, DNB, MRCOG(UK) is a Gynaecologist with special interest in infertility. She has over 10 years of proven experience in the field. She did her fellowship in Reproductive Medicine and Infertility. She underwent her professional training in India and in Yale University, USA, a world renowned premier institute in Healthcare and Medical research. She is a gold medalist from Andhra University, India. She has several publications on her name in the field of Obstetrics, Gynaecology and Infertility. Shashi Mamidibathula is co-founder and CEO of Medigrity Innovations since since its inception. He is a technocrat with a wide variety of technical and management experience and a seasoned entrepreneur having floated a few technology / consulting companies in US and India in the past. He has 20+ years of experience working at various levels in several organisations including Fortune 500 companies. He holds a Masters degree in Management Studies and M.S. in Mathematics from Birla Institute of Technology and Science, Pilani, Rajasthan, India. He also is a certified CPIM (from APICS) and a certified PMP (from Project Management Institute).